The Jeff Wilson Western Dressage Clinic, sponsored by the Western Chapter of the New York State Horse Council, was held September 28-30 2018 at Marie Bennett�s Fox Hunt Stables in Lockport. 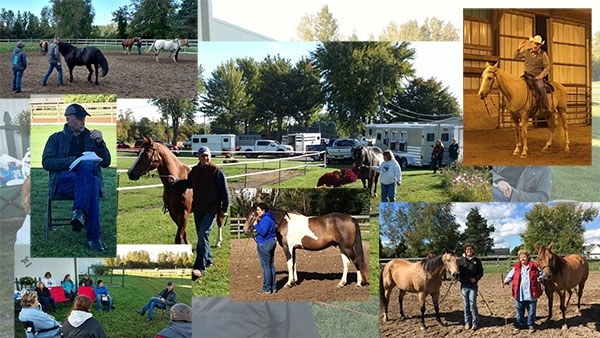 The clinic was filled to capacity with ten riders, and approximately 15 auditors observed Jeff apply his training techniques to make the horses subtle and responsive. Many of the riders stated that they were leaving with a different horse than the one they came with- one rider said that her horse had never felt so soft and collected prior to the exercises Jeff taught the participants. Barn Cunningham sponsored a scholarship that paid the registration fee for one 4h member. Applications were submitted, and Katelyn Schlager was selected to receive the scholarship. The WCNYSHC paid the audit fees for two 4H applicants, Maggie Noel and Sammy Syracuse, to observe the clinic. The WC also provided refreshments for the Meet and Greet at Fox Hunt Stables on Friday evening. A big thank you to Connie Zimicki and her 4H kids and parents for managing the refreshment table and making sure the participants and auditors had hot coffee, beverages and food throughout the day. Many of the riders and auditors expressed interest in having Jeff return again next year.